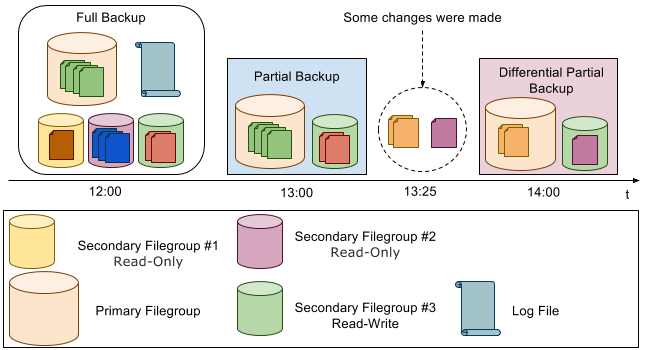 The peculiarity of partial backup is that it does not contain read-only filegroups. So it’s a good choice if your database has a read-only filegroup and there is no need to backup it all of the time. Though all recovery models in SQL Server support partial backup, it was primarily designed for use under the simple recovery model as it makes backup of huge databases, containing one or more read-only filegroups, more flexible. A partial backup can be applied both to full or differential backups, though it is not applicable to transaction log backup. As far as differential partial backup is concerned, only the data extents that have changed in the filegroups since the previous partial backup are recorded into it. Please note that differential partial backups can be applied only with partial backups. Note that SQL Server Management Studio does not support partial backups. To avoid this error, make another partial backup before a differential partial backup. Following this operation, the new partial backup will contain every read-write secondary filegroup.